1. In a blender, combine the salsa, cream cheese, 1 tablespoon lime juice, cilantro, honey and salt. Cover and process until smooth; set aside. 2. Place fish sticks on a baking sheet. Bake at 425° for 10 minutes. Sprinkle with half of the taco seasoning. Turn fish sticks over; sprinkle with remaining taco seasoning. Bake 7-9 minutes longer or until crisp. 3. Meanwhile, place tortilla chips on a serving platter. 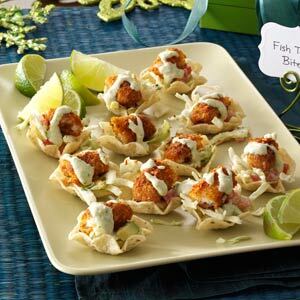 In a small bowl, combine the coleslaw mix, avocado, tomato, remaining lime juice and 1/2 cup salsa mixture. Spoon into chips. 4. Cut each fish stick into three pieces. Place a fish stick piece in each chip; top each with about 1/2 teaspoon salsa mixture. Garnish with lime wedges and additional cilantro. Yield: 3 dozen. Preheat oven to 450 degrees. Stuff each date with 3 or 4 pistachios. 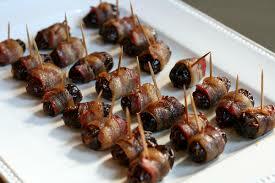 Lay a stuffed date and apricot strip on top of each bacon slice; wrap to enclose. Transfer to a rimmed baking sheet. Bake until bacon is crisp, about 10 minutes, flipping each wrapped date after 8 minutes. If frozen, bake at 400 degrees for 10 minutes; flip, and bake 10 minutes more. Transfer wrapped dates to paper towels to drain. 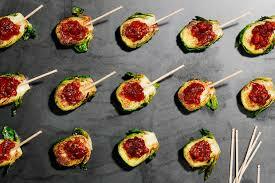 Serve with toothpicks.